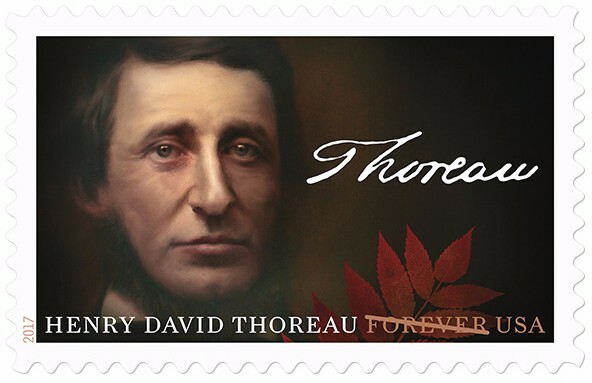 The US Postal Service will hold a First-Day-of-Issue dedication ceremony for the Henry David Thoreau Commemorative Forever stamp at Walden Pond in Concord MA tomorrow, May 23 at 11 AM. The event is free and open to the public. The stamp celebrates writer, philosopher, and naturalist Henry David Thoreau (July 12, 1817 – May 6, 1862) on the bicentennial year of his birth. The stamp art is an oil-on-panel painting of Thoreau’s face based on a famous 1856 daguerreotype by Benjamin Maxham. On the right side of the stamp is Thoreau’s signature of his last name. Below the signature is a branch of sumac leaves.